Interlake Mecalux has equipped the new CBN Group distribution center in Buenos Aires (Argentina) with a selective pallet rack system that accommodates 41,659 pallets. The warehouse contains an efficient picking method to supply its customers faster. Pallet size: 39" x 48"
The CBN Group is an Argentinian enterprise that runs high-productivity logistics centers where it provides 3PL storage for the most demanding multinationals in many different sectors, such as the automotive, pharmaceutical or consumer goods industries. The company built a new logistics center located in Tortuguitas, in the province of Buenos Aires, which called for a storage system suited to its customers’ broad range of products. 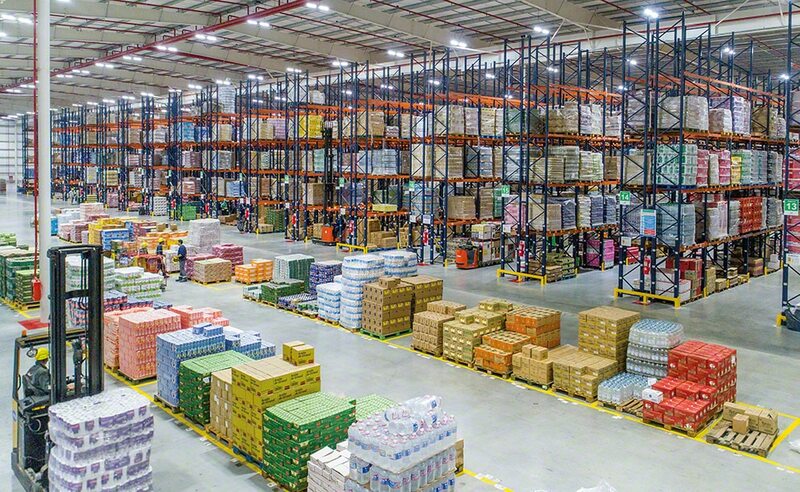 Following an analysis of the stored product types, the operations and the new warehouse’s size, Mecalux furnished the installation with the selective pallet rack system. Its adaptability facilitates product storage with a sizeable array of SKUs. Moreover, easy access to the pallets translates into top speeds when managing the flow of goods and order prep, as well as precise stock control. A warehouse sector has 31' high racks with five different levels, and in sectors where the warehouse is the highest, the racks are 34' high with six storage levels. Picking takes place on lower levels and reserve pallets are deposited on the upper levels, which means product is always available. Reach trucks are used to deposit pallets in the designated locations, as well as to replenish the lower storage levels with palletized goods. An underpass cuts crosswise through the blocks, facilitating operator workflows, in addition to acting as the emergency exit. Operators work via zones and are assigned to a few working aisles. Orders are assembled in waves, in other words, they prepare several at the same time, in the same trip. A-type products are placed directly on the ground floor, at one end of the racks. Meanwhile, picking of B and C products is done directly from pallets on the lower levels of the racks. Sorting goods according to their demand streamlines order prep. Operators run ground-level order pickers, able to transfer up to four carts –each corresponding to an order– filled with products deposited therein. The warehouse contains a spacious reception and dispatch area. The two operations are kept separate to avoid mix ups. Inflowing pallets are received from outside sources, waiting to be slotted into their assigned locations. A preloads zone is also set up on the floor where consolidated merchandise accumulates and carts with finished orders are gathered into groups. Subsequent deliveries are thus speedily loaded into trucks. Large capacity: these selective pallet racks have a storage capacity of more than 41,500 pallets. Excellent goods management: direct access to products benefits storage and picking work. Skilled picking: the rack layout and the use of certain equipment make order picking quick and easy.